In one of my previous post, i talked about the symptoms and a few hint on the treatment of Polycystic ovarian syndrome (PCOS). In this post, we shall be looking at some natural remedies for PCOS. I just listed 5 of them, which i believe are very effective in treating or serving as a remedy for PCOS. Polycystic Ovarian Syndrome (PCOS) is one of the most common hormonal imbalance conditions among women that affects millions all over the world. While there's no cure for the disorder, the symptoms can be managed with natural methods and the doctor's recommendations. Polycystic Ovarian Syndrome (PCOS) is one of the most complex female health disorders that has plagued five million women in the United States alone, One Medical reports. The symptoms may range from obesity, acne, mood disorders to alopecia (balding), polycystic ovaries, and irregular menstrual cycles, that can lead to infertility and other cardiovascular diseases. However, signs of PCOS don't just end there. Here are other symptoms of PCOS as identified by Natural Fertility Info: missed menstrual periods; anovulatory cycles; abnormal mid-cycle bleeding; excessive menstrual bleeding; hirsutism or the excessive presence of body hair; acanthosis nigricans or the darkening of the skin in the armpits, back of neck or groin; and recurrent miscarriages. PCOS may be successfully managed with the help of medications and hormone therapy, but there are also alternative ways to manage the symptoms naturally. The biggest problem with PCOS is insulin resistance. So we gathered diet and lifestyle tips from One Medical and Natural Fertility Info to help you manage PCOS and its symptoms. One Life has noted a study that suggests the timing of calorie intake can greatly affect glucose, insulin and testosterone levels. In the experiment, women with PCOS who ate most of their daily calories during breakfast have shown improvement in their insulin and glucose levels. More importantly, their testosterone level was decreased by 50 percent compared to women who ate big meals during dinnertime. Limit calories towards the evening. It is important to balance your daily protein intake with carbohydrates. It is advised to take in 5 meals a day than taking in three large meals. A decrease on AGEs (advanced glycation end products) intake can lead to lower glucose levels as one study suggested. Foods rich in AGEs are often found in processed and meat-derived products. If you're diagnosed with PCOS, best to avoid them. Cooking food on high heat, such as grilling, searing, and roasting also increase levels of AGEs. For a healthier diet, choose whole grains or sprouted grain products. More so, best to avoid processed carbohydrates, especially the white ones like flour, rice, and potato. A study found that a Vitamin D and calcium supplements, when taken with 1500 mg daily dose of metformin, have seen improvements in their BMI, menstrual cycles and other loads of symptoms. In the study, women with PCOS took their daily dose of metformin with 1,000 mg of calcium and 100,000 IU of Vitamin D for six months. Low magnesium levels are often associated with diabetes, an ending result if the symptoms of PCOS are not managed. Daily dietary supplement of Magnesium can increase insulin sensitivity. One study has shown that that there was a great improvement in insulin levels just by taking 300 mg of Magnesium overnight. Just like Magnesium, Chromium also works the same way. Another study suggests that the mineral almost works the same way as metformin in lowering glucose levels. If symptoms of PCOS can't be managed, it can lead to type 2 diabetes and cardiovascular disorders. There was a decrease in the androgen levels among women taking in three grams of omega-3 every day according to one study. It is also advised to exercise for 30 minutes in 5 days each week. Exercise helps insulin sensitivity and metabolism. You may want to visit your doctor to consult if you need any mineral or vitamin supplement. 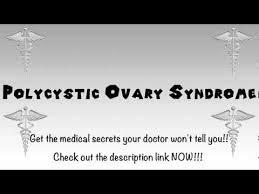 Your doctor can guide you accordingly concerning all you need to know about PCOS.